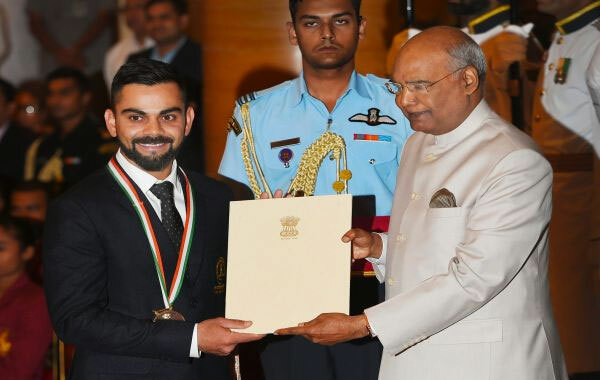 Indian cricket captain Virat Kohli and world champion weightlifter Saikhom Mirabai Chanu were conferred with the country’s highest sporting honour — Rajiv Gandhi Khel Ratna award — by President Ram Nath Kovind at the annual National Sports Awards ceremony here on Tuesday. This year’s award ceremony was postponed to September 25 from the usual August 29 National Sports Day event due to the clash of dates with the Asian Games in Indonesia. The Rajiv Gandhi Khel Ratna award is given for a ‘spectacular and most outstanding performance in the field of sports by a sportsperson over a period of four years’. Both Kohli and Chanu received a medal, a citation and a cash prize of Rs 7 lakh. Besides the Khel Ratna, star javelin thrower Neeraj Chopra, sprinter Hima Das, table tennis star Manika Batra were among the 20 recipients of the prestigious Arjuna award. The other Arjuna awardees were long distance runner Jinson Johnson, shuttler N.Sikki Reddy, boxer Satish Kumar, woman cricketer Smriti Mandhana, golfer Shubhankar Sharma, hockey stars Manpreet Singh and Savita Punia, Col. Ravi Rathore (Polo), shooters Rahi Sarnobat, Ankur Mittal, Shreyasi Singh, paddler G. Sathiyan, tennis player Rohan Bopanna, wrester Sumit, Pooja Kadian (Wushu). Para athlete Ankur Dhama and para shuttler Manoj Sarkar were also conferred with the Arjuna award, that included statuettes, certificates and a cash prize of Rs 5 lakh each.